CSDPrint works with lots of construction companies, contractors and property developers all over the country. We produce just about every type of construction and building site sign and graphic you can think of. From perimeter site hoardings, scaffold banners and feather flags to safety signs and hard hat stickers, CSD Print does the lot… and more! 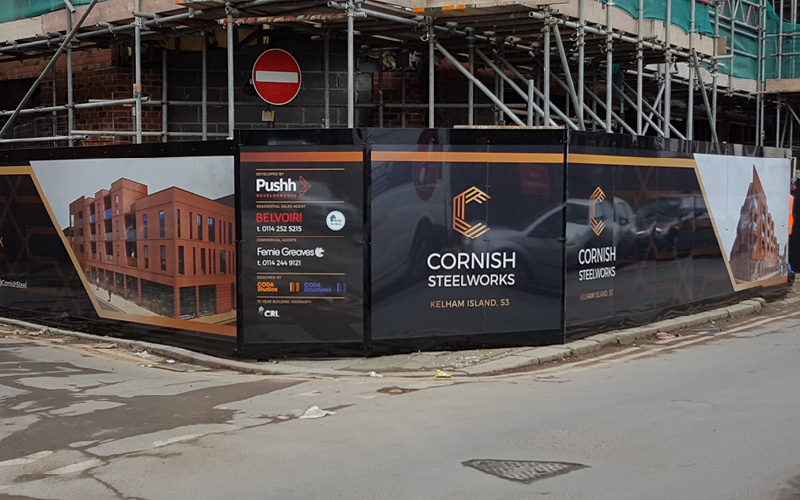 Our large format digital printing technology is perfect for producing oversized printed panels for use as site entrance contractor boards or for linked perimeter hoardings. It also makes light work of heavy duty weatherproof banners whatever the size. As well as our robust outdoor PVC banners, we also produce wind resistant mesh banners which are ideal for fitting to scaffolding. If you need top quality printed site safety signs and stickers, we can help with those too – CSDPrint has over 30 years’ experience of working with health & safety departments. We produce a huge variety of safe working and security signs and stickers ranging from simple ‘Keep Out’ and ‘Hazard’ signs to safety awareness information graphics incorporating attention grabbing mirrors and cut outs. We are really adaptable in our approach and are happy to either work with your design and fitting teams or we can manage your whole construction signage project for you.